It time for another challenge at Word Art Wednesday. This week we're focusing on a verse in the New Testament. Matthew 19:14, But Jesus said, suffer little children, and forbid them not, to come unto me, for of such is the kingdom of heaven. Children were very important to Jesus. On more than one occasion the Bible talks about how He called the children to Him, held them, and blessed them. When He used the little boy's lunch to feed the 5,000, He let us know that even children can be greatly used by God. So often in our society children are treated as burdens or impediments to our doing our "important" work. We have it so backward. Our children are our important work. They are rewards and blessings from the Lord and we need to treat them that way. 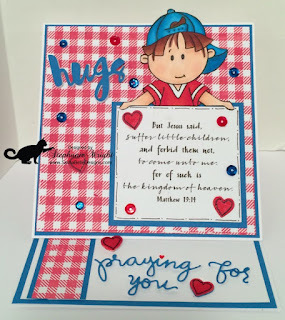 I used the SSS Gingham Background stamp on white cardstock and matted it with some blue cardstock I found in my stash. I'm not sure of the brand of the blue cardstock - maybe DCWV? I used the heart die from the Christmas Cats die set. Each heart was coated with a red glitter pen. Some were adhered straight to the base, some were stacked on other cardstock hearts and the easel stopper is on top of a die cut piece of fun foam. 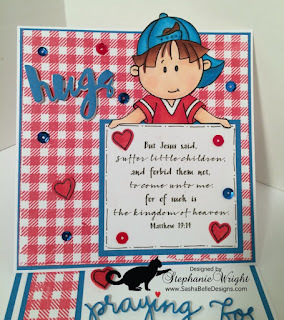 The finished size of the closed easel card is 5.5" square, however the boy's hat sticks out above the top edge of the card. 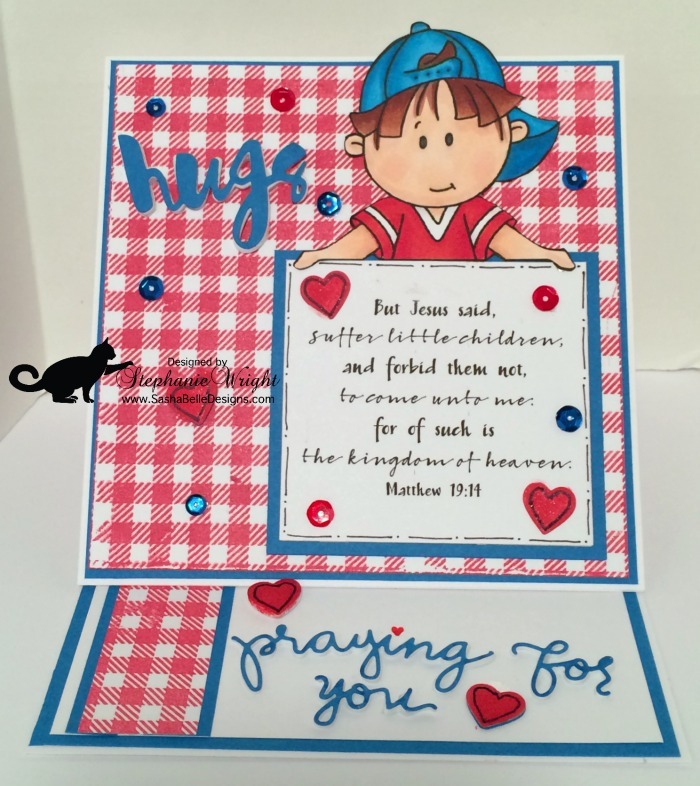 I cut the Painted Hugs die and the Praying for You die from blue cardstock and from fun foam. I saw a suggestion in a YouTube video (I can't remember who I was watching) that said to layer your cardstock on the fun foam die cut before you take the fun foam out of the negative. 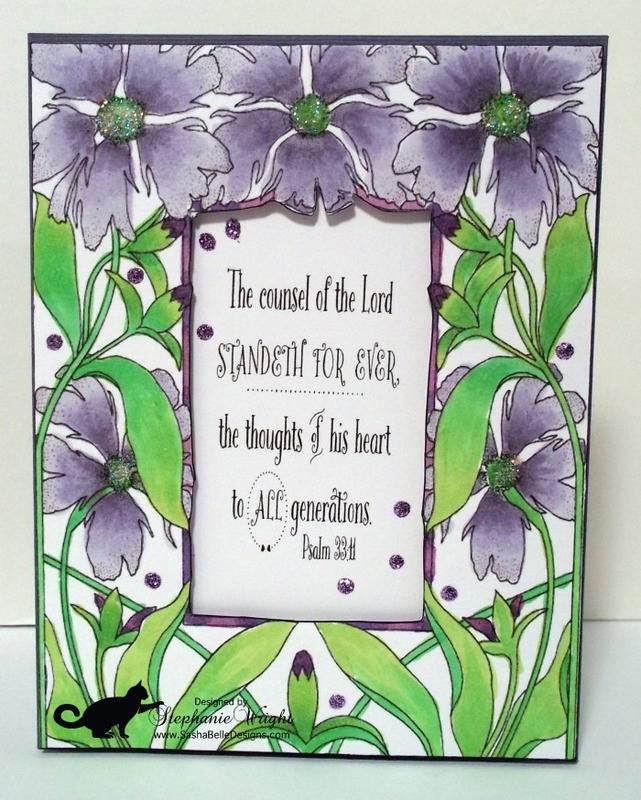 This was really helpful -- especially on the intricate Praying for You die cut. Some doodling with a black fine tip marker around the verse panel and on the hearts adds a little definition to their edges. I felt like they were getting a little lost into the background. I dotted the "i" with a hand drawn heart. I don't think the pen I used (Zig ball pen) is available anymore but you could easily use another fine tip red pen. The red pen in the Staedtler set that has the black pen I used for the other doodling would work well. A scattering of red and blue sequins finish it off. I've listed the products I used on this week's card below. I used affiliate links wherever possible. This means that if you make a purchase using one of my affiliate links (Simon Says Stamp and Amazon only), then I earn a small commission at no additional cost to you. Thanks for visiting with me today. Please be sure to visit the Word Art Wednesday blog to see the rest of the Design Team Projects and to pick up your free digi. 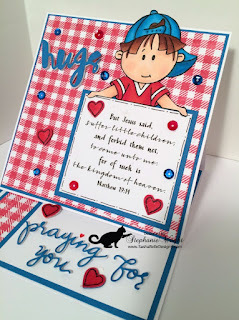 Also check out Simon Says Stamp - they are my favorite place online to shop for craft supplies. Hello, it's time for another challenge at Word Art Wednesday. 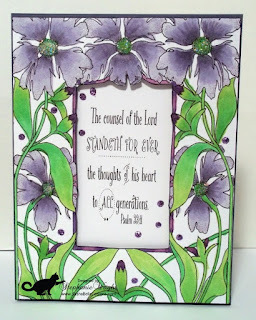 This week's focus verse is Psalm 33:11, "The counsel of the Lord standeth for ever, the thoughts of his heart to all generations." This verse is an example of the unchanging nature of God. He knows what is best and His Word is unchanging. His counsel and admonitions for the people in the Bible are still good and applicable to us today. We still shouldn't have idols or worship any god but Him. We should still be faithful to our spouse and honor our parents. God wants the best for us because He loves us. So often we see the "thou shalt nots" in the Bible as things designed to keep us from having fun. Instead, they are really the Lord saying to us, "don't hurt yourself" and His "thou shalts" are Him saying, "help yourself to some happiness." We tell our children not to touch a hot stove because even though they don't realize the danger, we know it will burn them. In the same way, the Lord tells us not to do certain things because He knows they will hurt us. God's Word is forever and just as true today as it was when He inspired the human authors to write the Bible. Last week I joined in the fun at the Island Time Crop sponsored by the SG Scrap Squad. This FB group put on a week long online celebration of National Scrapbooking Day. While I rarely scrapbook anymore, I plan to participate in the card and coloring challenges (the challenges aren't due until 5/31). Adult Coloring Pages are a big trend now. I enjoy finding (free) online coloring pages and then sizing them down so that I can use them on cards. That is what I did with today's card front. It was for one of the coloring challenges; we were to use 5 shades of pink, red, orange or purple and 3 shades of green to color a page of any theme and any size. After coloring the image, I cut it down to slightly smaller than an A2 card front. I also cut out the center panel. I ran a black copic around the cut edges to give it more of a finished look. I adhered fun foam to the back of the image panel to pop it up over the sentiment panel. I added stickles to the flower centers and some random lavender stickle dots for added sparkle. Once the coloring was done, this card came together very quickly. Thanks for stopping by for a visit today. Please be sure to stop by the Word Art Wednesday blog to see what the rest of the Design Team have made and to pick up your free digi. 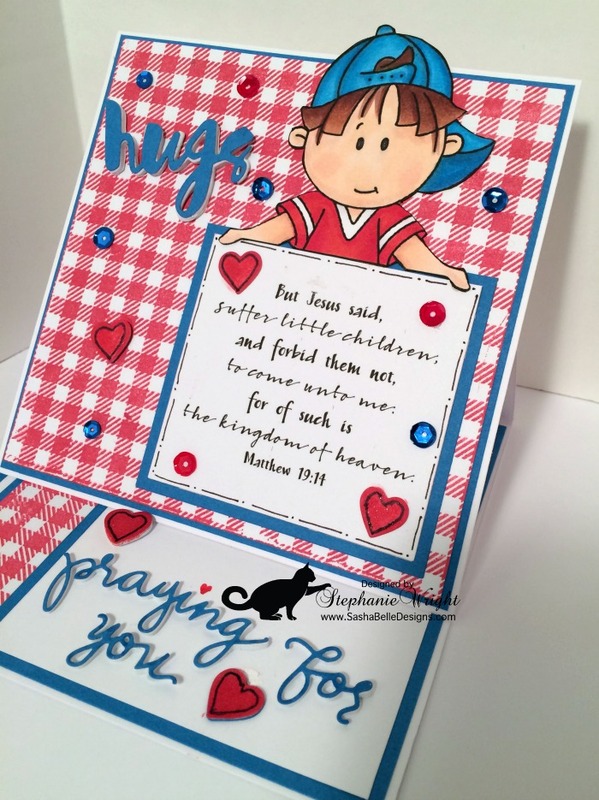 All the supplies I used for this card are listed below. Affiliate links are used when possible (at not cost to you). Have a good week!